These guys are about the softest and cuddliest rabbits we've ever seen! The disposition of Angoras is docile and curious. They make good pets as long as you have the time to attend to their special needs. They will need regular grooming to keep their fur in good condition and hay as a regular part of their diet to help prevent hair balls in their digestive tract. The Angora Rabbit has the finest, softest of coats. Their fur, which is quite long, is referred to as "wool". This breed of rabbit has been recognized since 1765. Dr. Jungle..."When is a bunny not just a bunny? "...Angoras will shed about every four months or so. The wool can be gathered either by shearing it or pulling it out by hand. Although earlier in this century Angora wool was in high demand, nowadays it is considered a cottage industry which supplies wool mainly for hand spinning." Background: Although it is not certain where they originated, most people agree that the original Angora Rabbits came from Ankara, Turkey in Asia Minor. Thus the name "Angora" comes from their place of origin, Ankara. It is also possible the name came from the Angora cat and Angora goat. These animals have the same type of fur and also come from Ankara. Description: There are four recognized breeds that are bred for showing. The English, French, and Satin Angora are medium in size while the Giant is considered a large. English Angora: This breed is probably the most distinctive since it has long heavy fur that covers it's body so that it is hard to tell the rabbit features like it's ears and face. (It is often mistaken for a small dog). Its body is rounded and so it literally looks like a ball of fluff. The fur on the face is fairly short and if you look closely you will see a doll baby face with large round eyes. There are fluffy tassels of wool lining the ears and the wool is silky and fine which makes it very soft. Most English angoras are very calm having being bred for good disposition in order to properly groom them. The English may grow to about 8.5 lbs. but is better to show at about 6 lbs. French Angora: The first picture above shows two French Angoras. They have no wool on their head, face, ears, or front feet. The rest of the body has a slightly coarse wool which is easy to spin. The French Angora's wool is the easiest to care for. It can weigh up to 10.5 lbs, with 9.9 lbs being ideal. 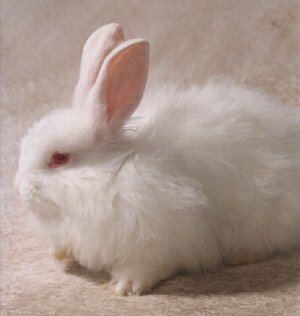 Satin Angora: The Satin Angora's wool looks like shimmering fibers. It does not have wool on the head, face, ears, or front feet. In this respect it is similar to the French Angora. The wool feels lighter and less dense than the other breeds because it is much finer. Giant Angora: This also is a very distinctive rabbit, mainly because of it's size! For showing they must be completely white. They have the densest wool of all the breeds, with a double undercoat which also gives them the most wool. They should weigh over 9 lbs. Care and feeding: There are several requirements that Angoras have that most rabbits don't need. They will need regular brushing to keep mats from forming in their fur. A good slicker brush (often used on dogs), can be used for this. Angoras have a special tendency to develop wool block, which is an intestinal problem. The addition of clean hay to their diet regularly will help prevent this problem. Color differences: The Angora Rabbits come in white, black, blue and fawn colors. FLYING and GREY SQUIRRELS for SALE!! Very young and socialized,great bonding and easy adaptable to new environments/persons/other home pets. We have flying squirrels/ Grey for sale. Are there any babies available? Are there any babies still available? I'm very interested. I was recommended by my friend to you sir. i want a grey baby squirrel I couldn't help but fall in love with the squirrel you shipped to my friend. I really need mine badly! I want to purchase 5 pairs of English Angora Rabbit. Would you please assist me in order to buy and to import to Pakistan? I am living in South Africa and have 3 bags of good quality white angora fur to sell but I don't know where to start. I have been on the internet but could'nt find any buyers to contact.